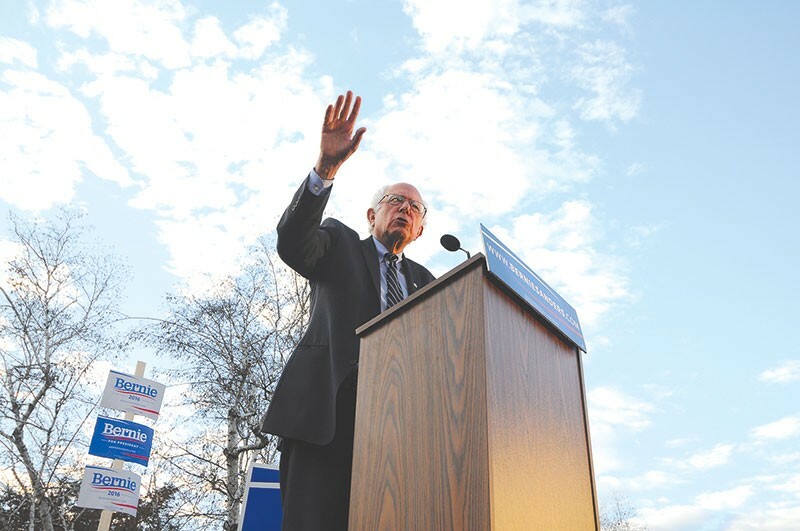 Could Bernie Sanders take the California primary with the North Bay's help? LONG SHOT TO GOT A SHOT Bernie Sanders' victory in Michigan has thrown arguments about Hillary Clinton's inevitable nomination up for debate. 'If he wins tonight, we could go to June." That was Democratic Party strategist Donna Brazile on CNN the night of Bernie Sanders' upset in the Michigan primary on March 8. Defying all expectations—even his own—Sanders beat Hillary Clinton by two points in a race that mainstream go-to pollsters such as Nate Silver said he would lose by 20 points, and perhaps more, just the day before the primary. Brazile's comment on CNN was code for "This might not be resolved until California," whose primary is on June 7 and where 546 delegates are up for grabs in the Democratic primary. There are three months to go, and numerous states will vote between now and then, but Sanders' Michigan upset put the tactical and tautological "inevitability" argument about Hillary Clinton into play—something that nobody saw coming, least of all the two-dozen California Democratic superdelegates who have already pledged their support, and their vote, to Clinton. So could Sanders actually win in California on his way to an upset win over Clinton for the nomination? And could Sanders' deep support in the Bay Area help push him over the top? A recent breakdown of Federal Election Commission figures shows that his supporters in Oakland and San Francisco have sent almost $900,000 to Sanders' small-bucks-only campaign. The most recent polls in California have him in the neighborhood of 10 points down from Clinton, but if the wildly errant polling data in the lead-up to Michigan is any indication, 10 points is well within the margin of statistical error in an election cycle where every prediction has been subject to debate, and is sometimes just flat wrong. "Of course Bernie can win California," says Bill Curry, a former speechwriter for Bill Clinton and two-time candidate for governor in Connecticut. Curry, now a political analyst and columnist, notes that polling data on Clinton and Sanders shows that primary voters are with Bernie on the issues—universal healthcare, support for a living wage, an end to pay-to-play politics—and he's got her beat by a long shot on the favorability factor. "But she has convinced them that she has a better chance of winning." Yet all bets are off after the Michigan upset, and that includes the Golden State. "California coming in at the end of the line," says Curry, "it wasn't expected to be important six months ago on the Democratic side." The question is whether Sanders' "political revolution" can find its reflection in the delegate count in time for the Democratic convention in Philadelphia this July. One takeaway from Michigan is that, while Donald Trump may claim to speak for the Nixonian bloc of "silent majority" voters, not only are his supporters not especially silent, they're not the majority, either—the violent minority is more like it. The voters who pushed Sanders over the top in Michigan may represent an actual silent majority that doesn't get picked up in polling, Curry says, and is made up of disfranchised citizens who have ditched politics altogether. "The poor, white working class has fled the civic life of the nation," Curry says. It's those voters who are emerging as a possible key to the race, as the "inevitability" argument gets chipped away by Sanders and his slow-roll delegate count (and by Clinton's gaffes, such as her unspeakably moronic comments about AIDS and the Reagans last week). At last count, Clinton had 1,231 delegates to Sanders' 576. The winning candidate will need to amass 2,383 delegates. The push for Bernie is already on in California, even if the vote is three months away. There are numerous events scheduled by supporters in coming days and weeks, lots of phone-banking and door-knocking all over Northern California. This Thursday, March 17, the Western Gate [R]evolutionary Teahouse in far-flung Lagunitas is hosting a pro-Bernie phone-and-computer night of outreach to potential supporters. One challenge for Sanders supporters and activists in California is to try to get already committed superdelegates to reconsider their support for presumptive nominee Hillary Clinton—not an easy task, given the tendency of liberal voters to view this election through a lens of fear, if not outright terror, at the prospects of any GOP candidate making it to the White House. In that rubric, Hillary is viewed as a "safe" bet for president. There are about four-dozen superdelegates in California, comprising elected officials at the national level and members of the Democratic National Committee. To date, the superdelegates are basically split down the middle: half have supported Clinton, while half remain uncommitted. None have thrown down for Sanders, at least not yet. "We are out in front on this," says Norman Solomon, the West Marin author, former congressional candidate and longtime critic of the pernicious and corrupting influence of corporate money in politics. Bay Area elected leaders, he says, need to be coaxed away from their predictable fealty to Democratic Party establishment expectations, especially now that Clinton's nomination is emerging as something less than a foregone conclusion. "We know from experience . . . that the heads of the Sonoma and Marin Central Democratic Committee are going to go with the national party hierarchy," Solomon says, as he points his waggishly progressive finger in the direction of two-term U.S. Rep. Jared Huffman. Last year, I asked Huffman who he was supporting in the Democratic primary, and the popular, progressive-minded congressman said he'd be supporting Clinton. She was going to be the nominee, Huffman reasoned, even as he praised Sanders for bringing a raft of welcome populist ideas into the campaign. Solomon, who ran against Huffman in 2012, is suggesting that the congressman reconsider his support for Clinton, especially given that the "inevitability" argument has been taken down a peg or two in Sanders' big-state win in Michigan. "He should withdraw his premature endorsement and pledge for Hillary Clinton at the convention and see how we vote in the June primary," Solomon says. Huffman says he's been talking about the superdelegate issue since before Solomon laid down his challenge, and does not think those voters are going to decide who the nominee is, "nor should they." Huffman fully expects Clinton to get the nomination, but speaking hypothetically, he notes that, "if for some reason that is not the case, all gets considered. I'm not going to go against the voters.... We'll see how this plays out. Fishing Report...Goes Fishing. Plus: Skitzo Roolz!